Anderson Park Offers the perfect settings for Weddings, Family and Social Functions, Musical & Theatrical Performances and Photo Shoots. 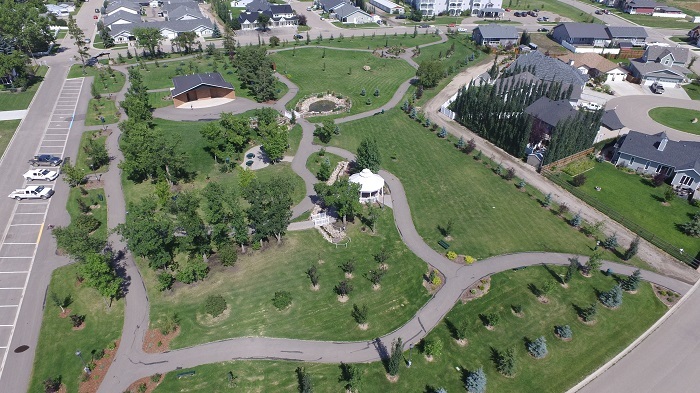 The picturesque, well maintained Park, Gazebo, Amphitheatre, Concession, Trails and ample Green Space offer a diverse range of rental and entertainment options. Note: Anderson Park is a public space and the park will not be closed for private functions, however, the amenities are available for private rental. Permits are not required for weddings or photography. If you are planning a large function it is advisable to contact the Town of Three Hills Office to verify that no other groups have booked the space at the same time. Anderson Park features numerous picnic table and seating areas, accessible trails and public washrooms. The Park boasts tranquil streams and a fountain, a raised flowerbed bench, and two bridges perfect for photo shoots. The little brown barn commemorates Anderson Farms where the park is now situated. Table and chair rentals are not included and can be acquired through Three Hills Rentals. The Anderson Park Gazebo is ideal for Wedding Ceremonies, Church Services and Photographs. Plenty of Green space is available for seating. The Concession contains a fridge, chest freezer, microwave, electric stove and sink. This kitchen is perfectly situated to store and serve food for small to medium social functions. An overhead window is also available for easy food and concession service. The Anderson Park Amphitheater is the pièce de ré·sis·tance of the Park. The covered outdoor stage area is directly attached to an indoor dressing room and washroom. A grassy slope has been built into the landscaping for convenient seating and a cement pad surrounds the space for accessibility. Click HERE for rates, capacities and facilities comparison.